Info about Motorola's upcoming phones is leaking from all sides these days, indicating that Moto may launch a G6, G6 Play and G6 Plus very soon, as the phones have been popping up in certification databases already, indicating a nearby release. 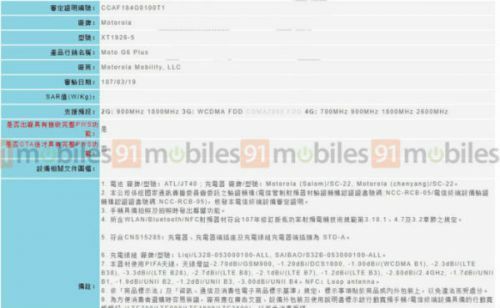 In the latest installment of those filings, the Taiwanese NCC has stamped its approval onto the G6 Plus, which is expected to be the top of the crop, complete with the supported plethora of LTE bands you see below. The Moto G6 Plus has passed through the certification process of Taiwanese telecom regulator NCC. This could mean that the handset will be launched in the Asian country in the near future. The device tested by the NCC is identified by the model number XT1926-5 and the listing on the website of the Taiwanese regulator shows that the device will support NFC. In addition, the listing on NCC's website shows that the handset can connect to 2G GSM, 3G WCDMA, and 4G LTE networks. The regulator stated that the smartphone is compatible with LTE networks running on bands 3, 7, 8, 28, and 38.